A systems-thinking approach to research and innovation strategy. We are experts at analyzing trends and developing frameworks for understanding how culture is changing and why. Our approach structures social signals to reveal critical patterns and emerging narratives that can become new brands, products, and services. Our skill is in uncovering the emerging stories that are missed in traditional research and providing data-driven evidence and inspirational innovation platforms to structure investment in new ideas. Our Culture Mapping informs a machine learning process that allows us to scan and analyze vast amounts of open and closed linguistic data and find emerging patterns in culture. 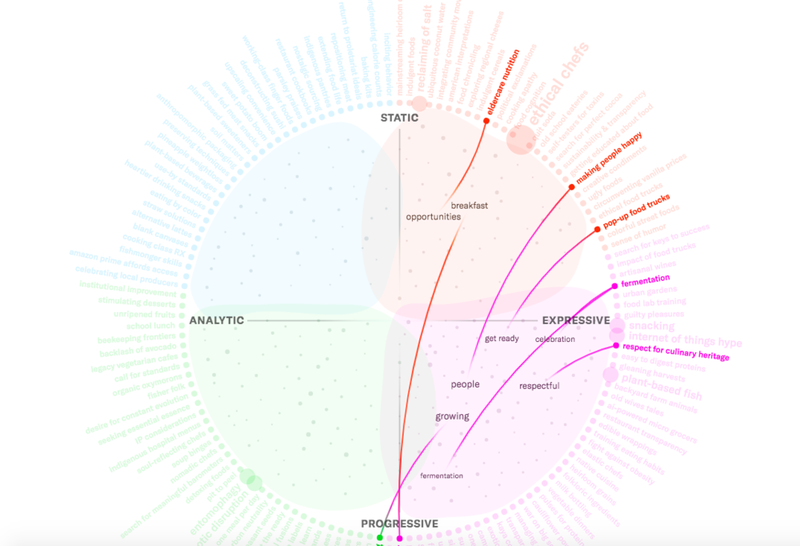 The analysis results in visualizations that help our clients understand trends in the context of data-supported archetypes and behavioral codes. Our experienced anthropology field teams around the world are skilled in conducting a broad range of investigations from home immersions to structured test environments. We also hold co-creation workshops involving category experts and industrial designers to develop innovation platforms and prototypes. The future of shared media. Media subcultures in Latin America. Emotional stories of business globally. The future of electric cars. Launching a new OTC brand. The future of mobile in Mexico. The meaning of beer in the USA. Sport as identity in Japan. The meaning of alternative bread. Online media subcultures in Asia.